Teen Challenge of the Upper Cumberland recently hosted the Power in the Pews Ministers Dinner at the Overton County Chamber of Commerce for area ministers. The purpose of the event was to engage local ministers and lay leaders in the Power in the Pews Faith Based Initiative, led by Tennessee Department of Mental Health and Substance Abuse Services. for places of worship and fellowship to support and strengthen families in their communities by offering recovery programs to help individuals with substance use and abuse on the road to recovery. 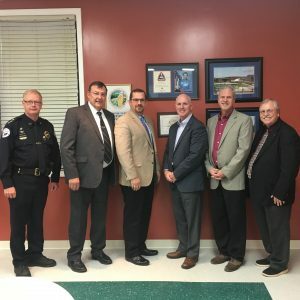 Pictured here are(L to R): Livingston Police Chief Greg Etheredge, Overton County Anti-Drug Coalition Director Pastor Roger Phillips, 13th Judicial District Attorney General Bryant Dunaway, Teen Challenge of the Upper Cumberland Executive Director Pastor Tim McLauchlin, Pastor Craig Green of First Church of Livingston, and Dr. Chris Ward of Riverside Baptist Association.